And the only time we actually get them in travel size are the samples during roadshows -_- lel. People like me head to the gym or run around so often that i'll always need a prep in the toilet to freshen up myself before heading to my next meeting. So that's why i was really happy when i heard SkinSoul's bestseller skincare range comes in a petite collection too! If you would like to learn more about their bestselling skincare range you can always drop by their outlets where their trained skincare professionals will give you a depth explanation on their products and even recommend you products for your skin needs. 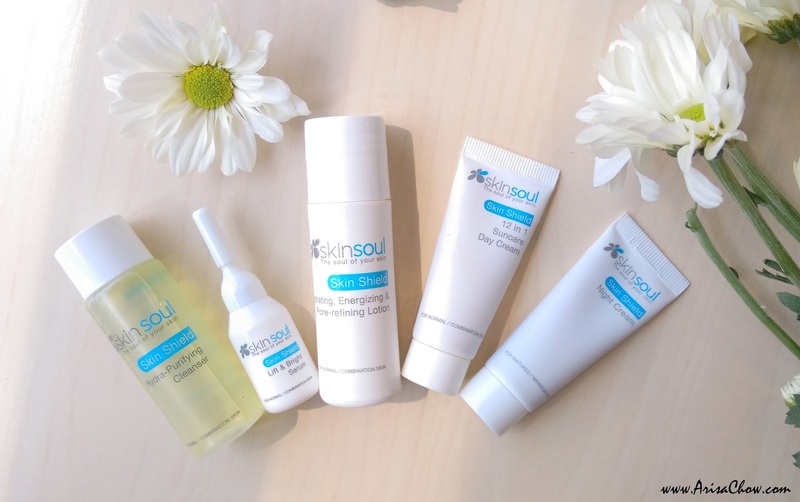 I myself was blown away when i was introduced to SkinSoul Skincare range, as you know somehow this year i seem to be reviewing quite a number of skincare products over the past few months lol so this brand is no exception lol. Well..one can never get enough of skincare till he or she has found the "RIGHT" one for her skin right? But at least this SkinSoul skincare set i am using for my after gym sessions is really gentle to my skin, it gives that refreshing and clean feeling without tightening your face. Reason given that this brand goes with their motto of being "paraben & harmful chemicals free" with using the best & most gentlest ingredients for the skin. What makes their skincare "so special"? SkinSoul's skincare range is called Skin Shield, it's name already obviously suggest that it is to protect your skin from any harmful radicals we face daily while regenerating our skin. Formulated in Switzerland, a country known for their skincare researches and innovations. Been hearing so much on how beautiful and breathtaking this country is, makes me wish i can visit that place one day! It consists of 4 main ingredients that plays a huge role in Skin Shield range which is the Organic Ashitaba, Red Microalgae Extract, Alps Botanical Stem Cells, Daisy Flower Extract and the famous Swiss Glacier Water. Organic Ashitaba Known for it's countless benefits, plant originated from Japan it has proven to reverse signs of ageing, diminishing wrinkles, fade age spots (pigmentation), regenerating skin elasticity and suppleness, heal skin irritations (what i need right now! Lol) and overall natural radiance. Explains very much on why Japanese women don't show much signs of aging till much later (towards 80 onwards) and their skin is ever so flawless. Red Microalgae extract Obviously a seaweed (my fav food lol) but this one is unique as it has a remarkable tenacity to survive in harsh conditions thanks to their soluble polysaccharide which is extracted to use for SkinSoul's Skin Shield range. It's main target is to protect our skin from the oxidative damages and pollutants surrounding us. Alps Botanical Stem CellsExtracted from an endangered species of apples grown only in the swiss alps, provides anti- ageing breakthrough that triggers the skin's stem cell drive potential for skin rejuvenation. Daisy Flower ExtractContains natural skin lightening and brightening agent. Swiss Glacier WaterNatural Spring water, pure from nature to each bottle of skinsoul products, sourced directly from the Valais alps. It is transferred using a type of nanotechnology system that increases its therapeutic efficiency and reduce toxicities. Skin Shield is suitable for every skin type (normal or combination) it is a product designed for all. 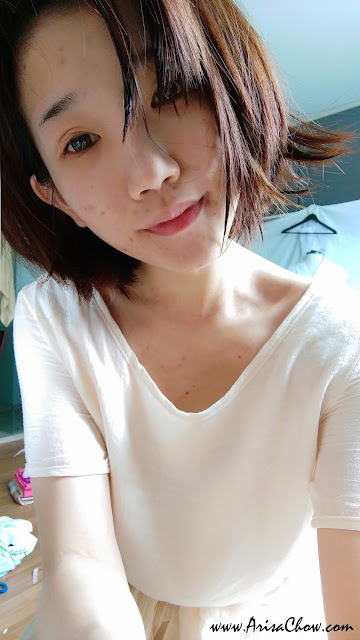 Mine skin type is a combination + extra sensitive so i will carefully select whether to review or not as not all products are suitable or to my liking. This travel kit comes with a set of facial cleanser, lotion toner, serum, day cream (love this!) and night cream which i have mix feelings using every one of them lol. I personally love the cleanser, toner and day cream but not too much on the serum and night cream i guess this 2 is targeted for more aged and matured skin. Fresh face after wash using Hydra purifying cleanser. The Hydra purifying cleanser is amazing as you only need 2-3 drops to lather your entire face, also my first time using a liquid based facial wash that isn't oil, very interesting. Had my cotton pad covered with a layer of skin dead skin and other dirt that can't be removed by washing alone. Lift and Bright serum is supposedly used after you have cleanse and toned, it has a slightly thicker textured that feels abit sticky and it does make your face feel "lifted and tighter" once it dries lol. Guess that's what they mean by INSTANT EFFECT! My favourite out of all would be the 12 in 1 Suncare day cream, it's tinted by the way so you'll get an instant brighten skin without having to put on any make up. You can used this for a make up based as it already contains sunscreen protection (SPF50) and it gives me an even skin tone before applying my makeup on especially not since it's filled with acne scars and pimples. Without this i have to use more concealer and thicker powder layer to cover it but with this cream i can put on a thin layer of make up like usual, plus this cream helps treat my skin problems while i am out and about. Nourishes skin for youthful radiance. if not too fair macam hantu. I use this set when I go for travel, it's nice to have this set when going to travel. I don't like to bring full size for travel its very bulky. It is dear! :) you should^^ good things are meant to be shared. I think these day cream are loved by everyone as quite convenient and helps to moisturize and acts as a BB cream too. Good for travelling. I love SkinSoul skincare. It will not tighten my skin after use it. And this product free from Paraben. eh? didn't you just do another review for skinsoul? or maybe that's for another product under the same brand. I like this product.... Skinsoul is a great brand.. LIke it..
Eh? They got traveling kit too? I really got to check it out! yes yes they do! :) you can try out their testers at their outlet in Mid valley. Wow... Love the way u take the photos! Tried this skincare too, love the Suncare Day Cream 12 in 1.
yeah i love the sunscreen too! great author. I will be sure to bookmark your blog and will often come back in the future.